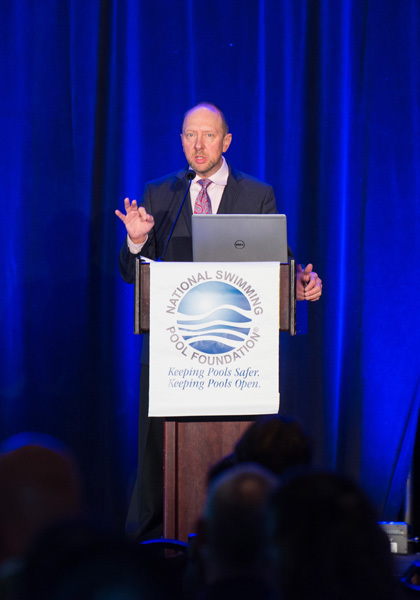 Colorado Springs, COLORADO—Having served as the CEO of the National Swimming Pool Foundation (NSPF) since 2003, Thomas Lachocki, Ph.D. has announced his plan to retire in 2019. Under Tom’s leadership, NSPF has grown from offering one product, Certified Pool & Spa Operator Certification, to becoming a market leader, delivering education and promotion to the residential construction, pool service, and commercial pool operation segments via classroom and online learning. In 2018, NSPF and GENESIS training programs reached over 40,000 professionals. Tom’s vision created the World Aquatic Health Conference (WAHC), which in 2018 celebrated its 15th year of exploring scientific advances and bringing together the leading thinkers and influencers in aquatics. WAHC attendees gather to keep people and pools safer and encourage more people to benefit from aquatic activity and immersion. The WAHC has also hosted the Council for the Model Aquatic Health Code (CMAHC) and NSPF is a founding sponsor for this organization.